A letter published one day before the full page statement from dozens of faith-based organizations published in the Kansas City Star. 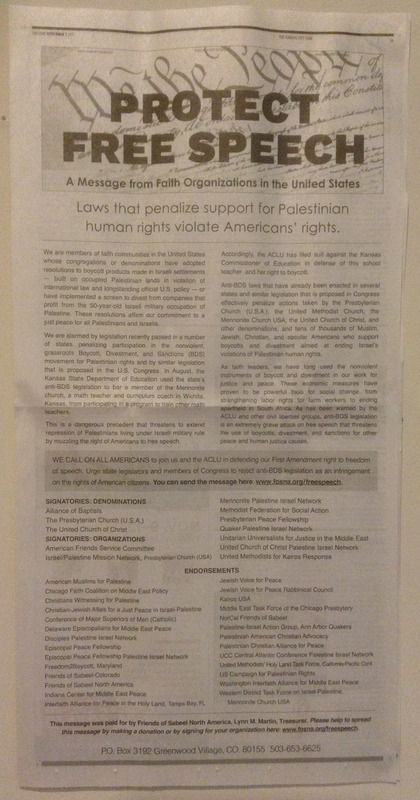 We are members of faith communities in the United States whose congregations or denominations have adopted resolutions to boycott products made in Israeli settlements—built on occupied Palestinian lands in violation of international law and longstanding official U.S. policy—or have implemented a screen to divest from companies that profit from the 50-year-old Israeli military occupation of Palestine. These resolutions affirm our commitment to a just peace for all Palestinians and Israelis. We are alarmed by legislation recently passed in a number of states penalizing participation in the nonviolent, grassroots Boycott, Divestment, and Sanctions (BDS) movement for Palestinian rights and by similar legislation that is proposed in the U.S. Congress. In August, the Kansas State Department of Education used the state’s anti-BDS legislation to bar a member of the Mennonite church, a math teacher and curriculum coach in Wichita, Kansas, from participating in a program to train other math teachers. This is a dangerous precedent that threatens to extend repression of Palestinians living under Israeli military rule by muzzling the right of Americans to free speech. Accordingly, the ACLU has filed suit against the Kansas Commissioner of Education in defense of this school teacher and her right to boycott. 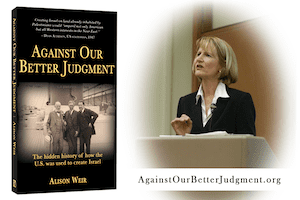 Anti-BDS laws that have already been enacted in several states and similar legislation that is proposed in Congress effectively penalize actions taken by the Presbyterian Church (U.S.A.), the United Methodist Church, the Mennonite Church USA, the United Church of Christ, and other denominations; and tens of thousands of Muslim, Jewish, Christian, and secular Americans who support boycotts and divestment aimed at ending Israel’s violations of Palestinian human rights. WE CALL ON ALL AMERICANS to join us and the ACLU in defending our First Amendment right to freedom of speech. Urge state legislators and members of Congress to reject anti-BDS legislation as an infringement on the rights of American citizens.